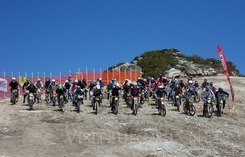 Borovets hosted Drop The Mountain Borovets 2013 - the first mass bike ride on mountain terrain in Bulgaria. It started on May 11th, 0100 PM from Yastrebetz peak (near Top station of the Gondla lift - 2369 m. of altitude), then crossed Markudjik center still covered with snow and ended in front of the Rila hotel in the resort's centre. The trail was 14 km. long and the organizer of the event arranged perfect conditions. 65 men and 4 women took place in the competition. Minister Petar Stoychev awarded the winners.